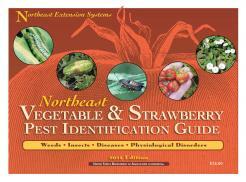 A 55 page comprehensive pest identification guide that can be carried to the field to better identify pests and select appropriate management measures. It contains color photos of all of the insects, diseases, and weeds that are described in the regions various Vegetable Management Recommendations, including photos of weeds at the seedling stage and disease symptoms on different crops. Edited by Richard Bonnano and Ruth Hazzard and specialists from across the Northeast in 2013. Available from the Univ. of Mass. Bookstore at 413-545-2717 or online at umassextensionbookstore.com; $12.00 plus $5 shipping and handling or free with your $25 copy of the New England Vegetable Management Guide. This publication is also available as a downloadable pdf file. See attachments below.